Azure Blob storage is a service that stores unstructured data in the cloud as objects or blobs. Blob storage can store any type of text or binary data, such as a document, media file, or application installer. Blob storage is also referred to as object storage. 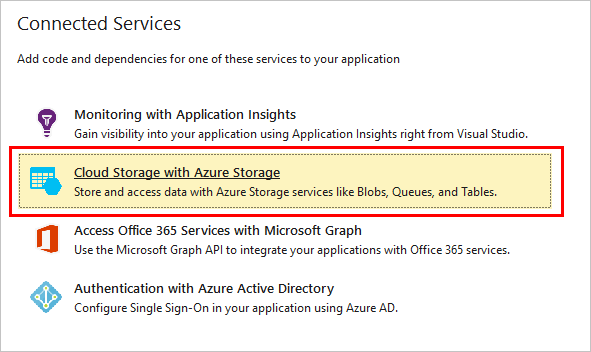 To learn more about Blob storage, see Introduction to Azure Blob storage. This tutorial shows how to write ASP.NET code for some common scenarios that use Blob storage. Scenarios include creating a blob container, and uploading, listing, downloading, and deleting blobs. Manage Azure Blob storage resources with Azure Storage Explorer. Azure Storage Explorer is a free, standalone app from Microsoft that enables you to manage Azure Blob storage resources. Using Azure Storage Explorer, you can visually create, read, update, and delete blob containers and blobs, as well as manage access to your blobs containers and blobs. This section walks through setting up the development environment. This includes creating an ASP.NET MVC app, adding a connected services connection, adding a controller, and specifying the required namespace directives. From the main menu, select File > New > Project. 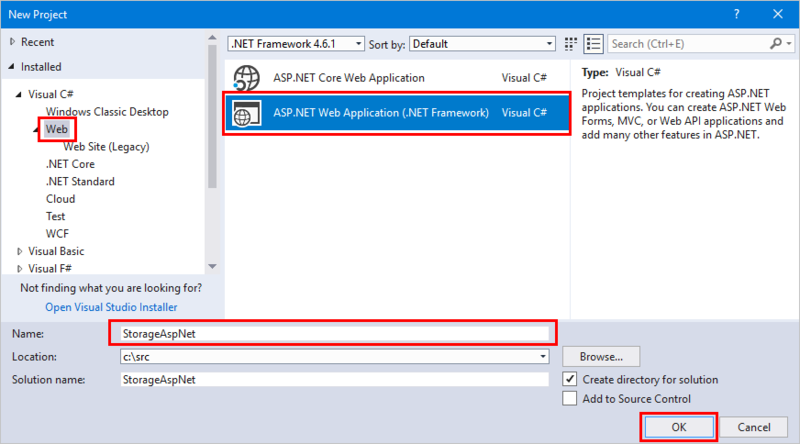 In the New Project dialog box, select Web > ASP.NET Web Application (.NET Framework). In the Name field, specify StorageAspNet. Select OK. 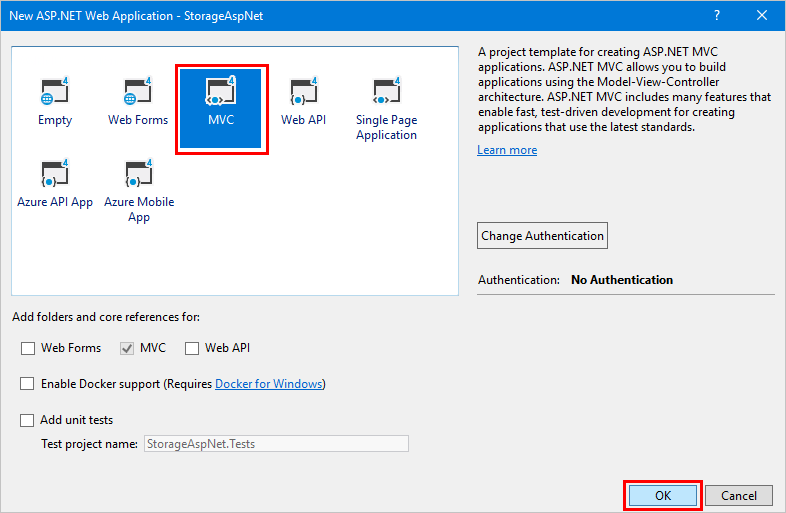 In the New ASP.NET Web Application dialog box, select MVC, and then select OK. In Solution Explorer, right-click the project. From the context menu, select Add > Connected Service. In the Connected Services dialog box, select Cloud Storage with Azure Storage. In the Azure Storage dialog box, select the Azure storage account to be used for this tutorial. To create a new Azure storage account, select Create a New Storage Account, and complete the form. After selecting either an existing storage account or creating a new one, select Add. Visual Studio installs the NuGet package for Azure Storage and a storage connection string to Web.config. In Solution Explorer, right-click on Dependencies, choose Manage NuGet Packages, and add a NuGet package reference to the latest version of Microsoft.Azure.ConfigurationManager. To learn how to create a storage account with the Azure portal, see Create a storage account. You can also create a storage account by using Azure PowerShell, Azure CLI, or Azure Cloud Shell. In Solution Explorer, right-click Controllers. From the context menu, select Add > Controller. 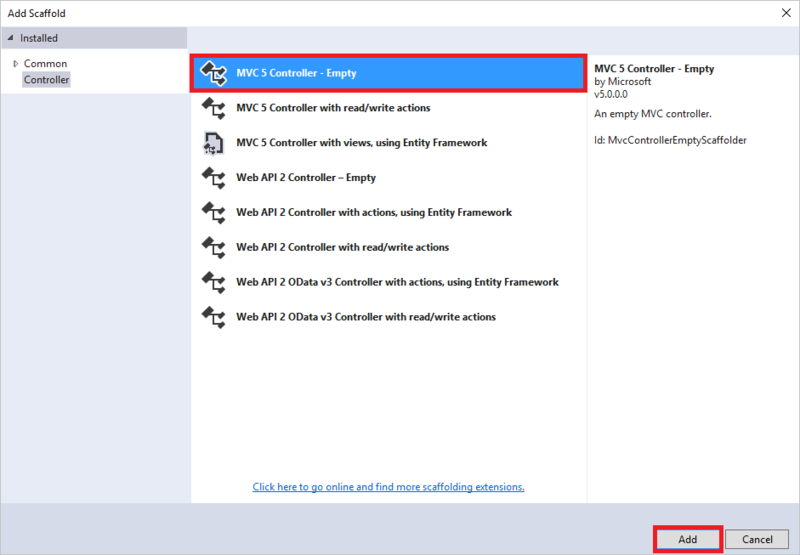 In the Add Scaffold dialog box, select MVC 5 Controller - Empty, and select Add. In the Add Controller dialog box, name the controller BlobsController, and select Add. A blob container is a nested hierarchy of blobs and folders. The rest of the steps in this document require a reference to a blob container, so that code should be placed in its own method for reusability. The following steps create a method to connect to the storage account by using the connection string in Web.config. The steps also create a reference to a container. The connection string setting in Web.config is named with the format <storageaccountname>_AzureStorageConnectionString. Add a method called GetCloudBlobContainer that returns a CloudBlobContainer. Be sure to replace <storageaccountname>_AzureStorageConnectionString with the actual name of the key in Web.config. Even though test-blob-container doesn't exist yet, this code creates a reference to it. This is so the container can be created with the CreateIfNotExists method shown in the next step. Add a method called CreateBlobContainer that returns an ActionResult. // The code in this section goes here. Get a CloudBlobContainer object that represents a reference to the desired blob container name. Call the CloudBlobContainer.CreateIfNotExists method to create the container, if it does not yet exist. The CloudBlobContainer.CreateIfNotExists method returns true if the container does not exist, and is successfully created. Otherwise, the method returns false. Update ViewBag with the name of the blob container. In Solution Explorer, right-click the Views folder. If there isn't a Blobs folder, create one. From the context menu, select Add > New Folder. Name the new folder Blobs. In Solution Explorer, expand the Views folder, and right-click Blobs. From the context menu, select Add > View. In the Add View dialog box, enter CreateBlobContainer for the view name, and select Add. In Solution Explorer, expand the Views > Shared folder, and open _Layout.cshtml. As mentioned previously, the CloudBlobContainer.CreateIfNotExists method returns true only when the container doesn't exist and is created. Therefore, if the app is run when the container exists, the method returns false. When the blob container is created, upload files into that container. This section walks through uploading a local file to a blob container. The steps assume there is a blob container named test-blob-container. Add a method called UploadBlob that returns a string. Within the UploadBlob method, get a CloudBlobContainer object that represents a reference to the desired blob container name. Azure storage supports different blob types. This tutorial uses block blobs. To retrieve a reference to a block blob, call the CloudBlobContainer.GetBlockBlobReference method. The blob name is part of the URL used to retrieve a blob, and can be any string, including the name of the file. Run the application, and select Upload blob. The word success! should appear. This section illustrates how to list the blobs in a blob container. The sample code references the test-blob-container created in the section, Create a blob container. Add a method called ListBlobs that returns an ActionResult. Within the ListBlobs method, get a CloudBlobContainer object that represents a reference to the blob container. To list the blobs in a blob container, use the CloudBlobContainer.ListBlobs method. The CloudBlobContainer.ListBlobs method returns an IListBlobItem object that can be cast to a CloudBlockBlob, CloudPageBlob, or CloudBlobDirectory object. The following code snippet enumerates all the blobs in a blob container. Each blob is cast to the appropriate object, based on its type. Its name (or URI in the case of a CloudBlobDirectory) is added to a list. As shown, the list includes only the top-level entities, not the nested ones (bar.png and baz.png). To list all the entities within a blob container, change the code so that the CloudBlobContainer.ListBlobs method is passed true for the useFlatBlobListing parameter. In the Add View dialog box, enter ListBlobs for the view name, and select Add. This section illustrates how to download a blob. You can either persist it to local storage or read the contents into a string. The sample code references the test-blob-container created in the section, Create a blob container. Add a method called DownloadBlob that returns a string. Within the DownloadBlob method, get a CloudBlobContainer object that represents a reference to the blob container. Get a blob reference object by calling the CloudBlobContainer.GetBlockBlobReference method. Run the application, and select Download blob to download the blob. The blob specified in the CloudBlobContainer.GetBlockBlobReference method call downloads to the location specified in the File.OpenWrite method call. The text success! should appear in the browser. Add a method called DeleteBlob that returns a string. Within the DeleteBlob method, get a CloudBlobContainer object that represents a reference to the blob container. To delete a blob, use the Delete method. Run the application, and select Delete blob to delete the blob specified in the CloudBlobContainer.GetBlockBlobReference method call. The text success! should appear in the browser. Select the browser's Back button, and then select List blobs to verify that the blob is no longer in the container. In this tutorial, you learned how to store, list, and retrieve blobs in Azure Storage by using ASP.NET. View more feature guides to learn about additional options for storing data in Azure.